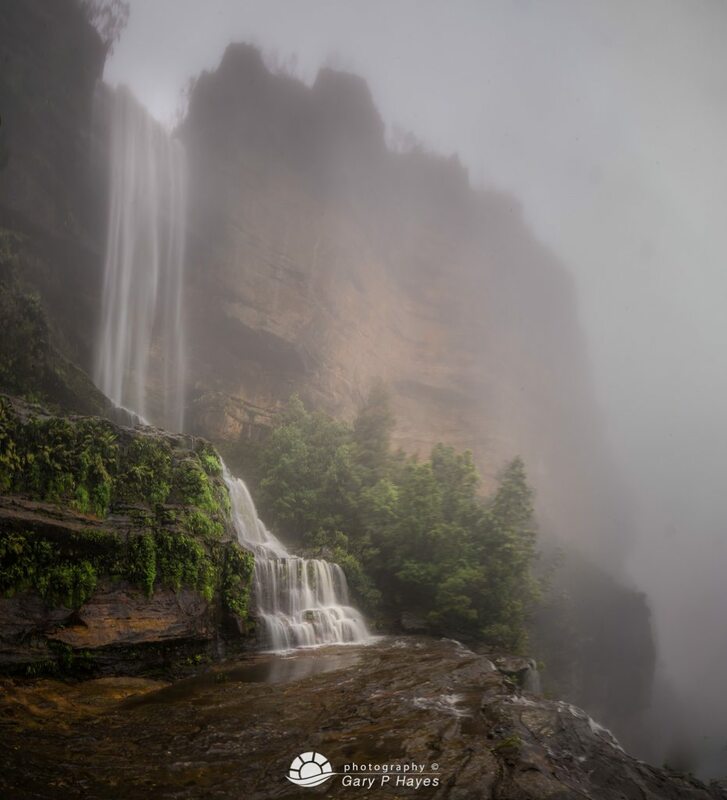 ABOUT: The mighty (in wet weather) Katoomba Falls is around 800ft or 250m high in three sections. There are various vantage points on the western escarpment under Scenic World but the best position is up close and personal with the top and middle sections. It is hard to get a good perspective correct shot of both sections from here as it is almost a 120 degree vertical sweep and you are only 10 meters from the main flow. The middle falls themselves are worth close ups using say a 50mm from the fence, but getting both will require a 14mm stitch. Go in wet weather when the mist and flow is good, summer midday not so good. There is also a classic panorama here sweeping to the view off to the right with Jamison Valley and Mount Solitary completing an amazing ledge vista. Also consider sunset when the last rays from the right make the area glow orange. Finally if you want reflections in the pool below the smaller section you can climb over the fence easily BUT stick to the left hand side as the drop on the right will mean certain death. PHOTO EQUIPMENT TO BRING: You will be walking for about 35 minutes down and then back up so bring what you need only. Umbrella, sturdy tall tripod, and a mix of ultra wide and standard 50mm. Consider polarisers in dry weather and bring a lens cleaner as when windy the falls can dump a little on you. GETTING TO THE SPOT/S: The quickest way down (approx 150m descent) is towards the Furber Steps. You can park free in Scenic World and walk down the wooden platform to the left of it and you will see the right route about 50m the boardwalk finishes. Keep following the signs to the Furber Steps (some step sections on metal stairs) past Vanimans, Juliets Balcony but don’t go as far as the steps themselves – then a sign saying ‘mid falls’ will be visible as a left turn. This walk is only about 10 minutes or so, there could be puddles to negotiate in heavy rain. An alternative route is by parking at Katoomba Kiosk and following the route past Witches Leap to Rainforest View and again pick up the route to Furber Steps and you will see the sign to the left again, about 10 mins walk again.